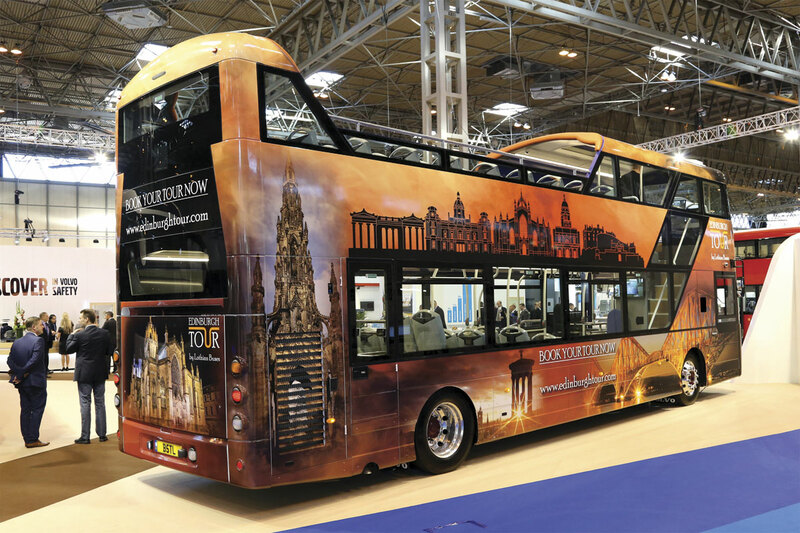 Euro Bus Expo is the UK’s big show, for three days every two years it provides the industry with a market place in which its products can physically be seen alongside each other. It usually attracts a crop of new models and this year was no exception with huge emphasis on cleaner propulsion, whether diesel, electric or gas, as well as the latest enhancements to improve the passenger experience in both buses and coaches. This article concentrates on the large vehicles at the show and their manufacturers and suppliers and for reasons of space may gloss over the details of models that have been extensively covered in pre-show issues. My colleague, Rob Orchard, was also there and has compiled the second part of our report covering the smaller vehicles available, so most details on coaches with 41 seats or less will be found there. Other members of the team have covered many of the exhibits relating to technology, products and services and these will appear in the third part of our report. There was so much to see and so many people to talk to that it would be easy to write an article on each of the exhibitors, but space and time preclude that; hopefully reading this will give you a little bit more information than you gained if you attended and a lot more than if you didn’t make it to Birmingham. ADL claimed that this was their biggest ever presence at Euro Bus Expo showing a total of nine vehicles, and there was a lot new to see. In 2016, it has exceeded the achievements of 2015, building 2,750 buses globally and is on course to generate revenue in excess of £600m for the second successive year. These figures include over 1,000 Enviro400s for the UK. Destined to be a demonstration bus, the Enviro400 City shown heralded the optional new Passenger Plus package which features: SmartConsoles with wireless bell pushes, USB power sockets, dimmable LED lap lights, coat hooks and fold-down tables within seat backs; single seats next to the staircase upstairs; ‘social seating’ around tables with USB power sockets integrated in their surface; a SkyView rear window and three glazed SkyLights; no vertical hand rails in the upper deck; dimmable saloon lighting and LED downlighters; and litter bins on both decks. 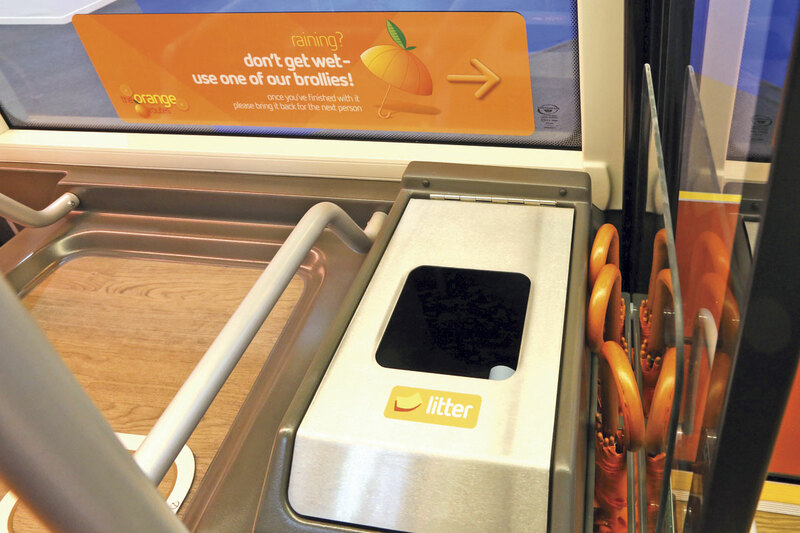 It makes for a very attractive customer experience but several operators I spoke to questioned the wisdom of the absence of stanchions, fearing additional personal injury claims. Jointly developed with Scania and said to be the world’s first gas fuelled double deck Euro6 city bus, the Enviro400CBG bodied Scania NUD280 4x2NU was from a batch of five being delivered to Reading Buses in a distinctive blue livery for the ‘Royal Blue’ 33 service. 11.4m long with 72 Civic V3 seats, they have USB power points and coat hooks at all seats, as well as tables with Aircharge wireless charging pods and upper deck litter bins. 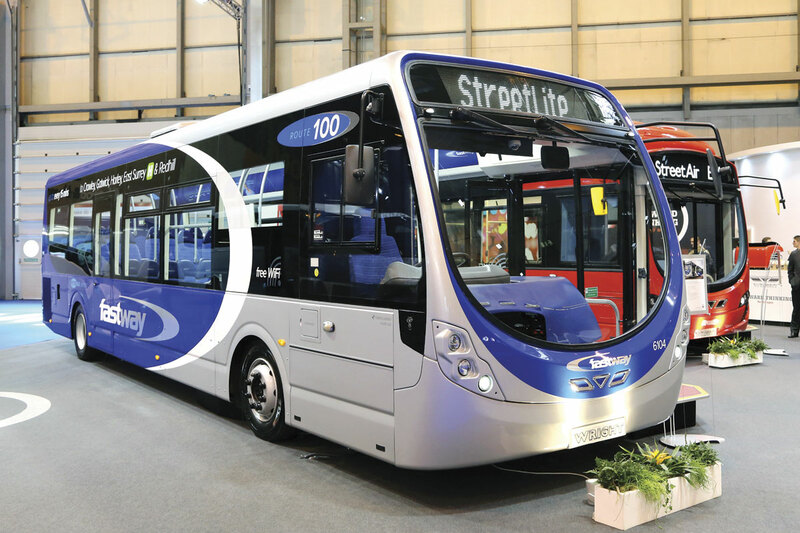 Both the Enviro200 and Enviro400 diesels can be certified for LCEB as they now employ E-Cooling along with the new SmartPack that takes the existing Stop/Start capability and adds SmartAir and SmartCharge systems that ensure the alternator and compressor are charging during deceleration. Coming next year is the SmartHybrid system which employs a small electric motor fed by low voltage supercapacitors that last the life of the bus to boost acceleration and reduce diesel engine load. Independent tests suggest that the SmartPack saves 17% fuel over standard Euro6 diesel and SmartHybrid takes that to 23%, though ADL Group Engineering Director, Ken Scott, says between 15-18% is a real world figure for the full suite of options. As well as the two Enviro400 MMCs shown by ADL, and one on the Scania stand, a fourth destined for National Express appeared outside. One of the latest batch of 96, the 10.9m bus seated 73 (43/30) and was LCEB compliant with Cummins 250hp engine, Voith DIWA6 transmission, E-Cooling, Smart Pack and Fluidmaster. 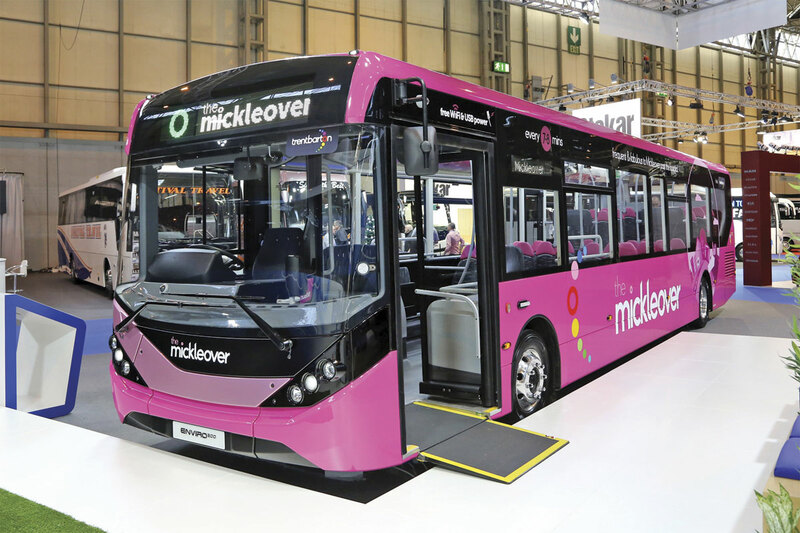 Two Enviro200s were shown, one a BYD/ADL Enviro200EV from the batch for GoAhead London that has already been extensively covered in these pages and the other, looking stunning in a pink livery, was an 11.8m Enviro200 MMC for trentbarton’s ‘the Mickleover’ from a total order for 22 buses (including 14 that are 10.8m long). Cantilevered Esteban Civic V3 seating for 42 (including tip-ups) is provided with a standee capacity of 22. On the coach range, revised external styling coupled with underbody streamlining on the Plaxton Elite reduces the drag coefficient to 0.33 and is said to cut fuel usage by 4%. Back in 2008 Country Lion took the first Elite and they have now taken the first of the latest design, a 14m Volvo B11R 6×2 model complete with 48 Fainsa Gala 1018 recliners, 20 of them at tables. 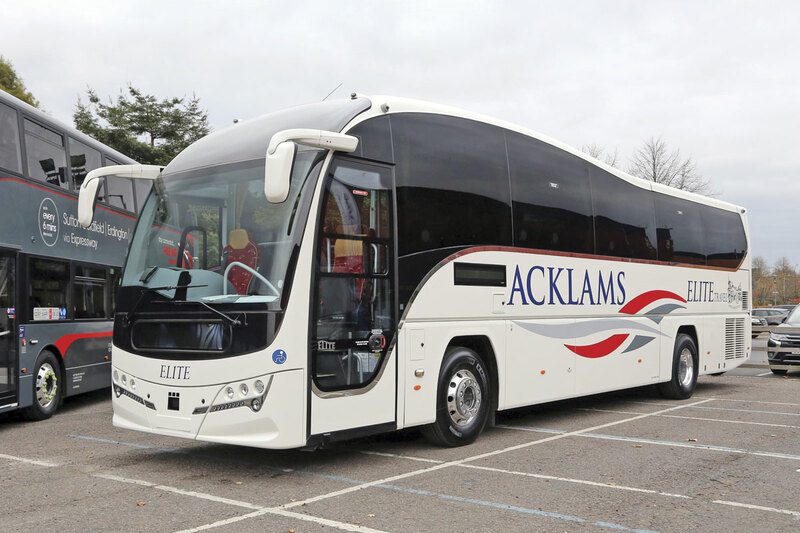 A second Elite appeared outside in Acklams livery on a 12.6m two axle Volvo B11R with 460hp engine and I-Shift transmission. This offered 53 Politecnica Relax GTI seats, increasing to 59 if the toilet is demounted. Quite a talking point among operators was the 12.8m Volvo B8R Panther executive for Hodgsons. 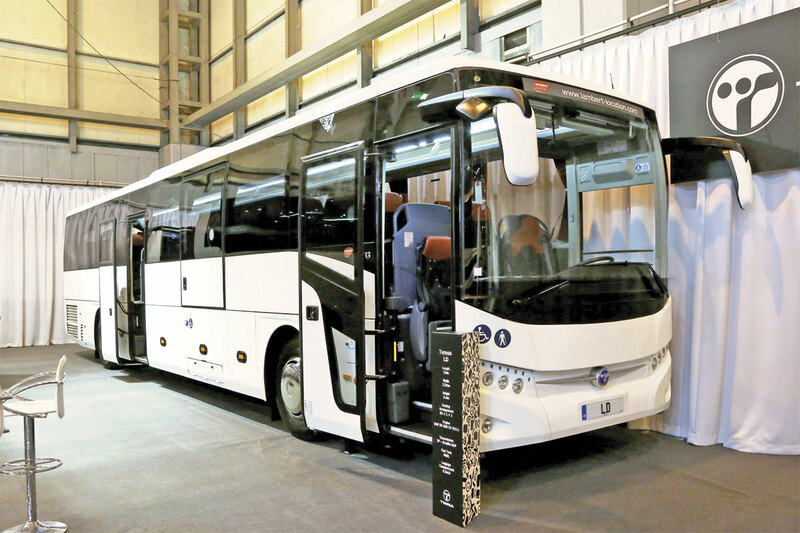 ADL representatives stressed its economy and flexibility and with 57 Brusa Extend 300 seats (59 if the toilet is demounted) it is not only a vehicle for a full range of work but one that can be cascaded through the fleet. It was well specified and equipped with the 7.7-litre Volvo D8K 350hp engine and I-Shift transmission. Outside was a 9.6m Cheetah XL bodied Mercedes-Benz Atego 1218L with 177hp engine and Powershift transmission. This demonstration coach had 32 Brusa Extend recliners, toilet and servery, as well as a revised entrance layout intended to make boarding easier. Though there was a lot new to see on the Volvo stand, the event was sadly overshadowed for the company and its staff by the announcement of the death of former MD, Mike Ball, at the age of only 57, during the show. Volvo Bus CEO, Hakan Agnevall, reiterated Volvo’s three point electromobility programme which is based on a product line up of diesel hybrid, electric hybrid and full electric vehicles, rental rather than purchase of batteries and open charging platforms. The latest member of the electromobility family is the new B5LHC double deck which is a development of the B5LH hybrid and appeared on the stand complete with an opportunity charging gantry. 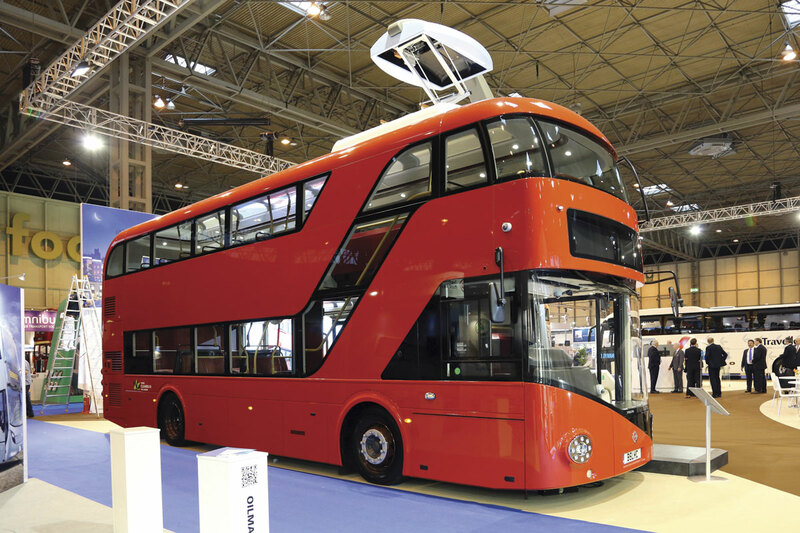 Bodied by Wrightbus using the SRM design, it has regenerative braking, a more powerful electric motor and Lithium Ion batteries rated at 19kWh as well as the overhead opportunity charging system developed for the 7900E and 7900EH. It is able to run for seven kilometres in zero emission mode before it needs charging. The seating capacity is 60, 43 of them on the upper deck and 17 at the rear of the lower deck, with a total capacity including standees of 88. Impressive though the B5LHC is, I did not like the way that the batteries took up the whole of the nearside space between the front and centre doors, creating what is effectively a tunnel for passengers to go through, the claustrophobic aspect of which is not helped by the dark TfL colours and the absence of a rear window. I admit I don’t know how you would do it but I think this could be packaged better. Volvo’s second double deck exhibit was one of the 30 open Top Wrightbus Gemini 3 bodied B5TLs delivered earlier this year to Lothian Buses. It has a 95 passenger capacity. During the show, Lothian Buses announced a four year framework deal with Volvo and Wrightbus running from 2017. Making its show debut on the coach side was the Jonckheere JHV2 on the B11R chassis with D11K 430hp engine and Volvo I-Shift transmmission. It is a decade since VDL originally launched the JHV and this revamp is more noticeable on the inside, where there is a stylish new dash and the new Fainsa Brava seat as standard, than on the outside where the changes are really very minor. As a tri-axle it is offered at two lengths, 13.4m and 14.0m. The show coach was one of four ordered by Travellers Choice. Outside Volvo displayed a Sunsundegui SB3 bodied Volvo B8R and a Volvo 9700. 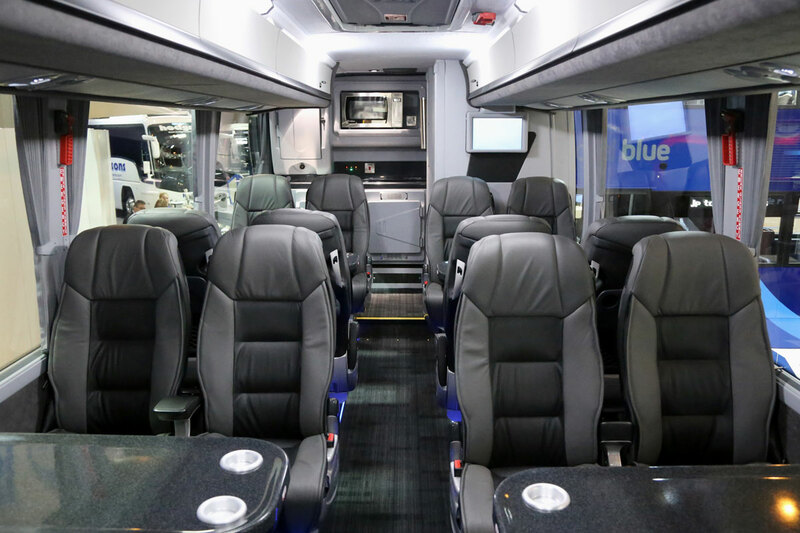 During the event, GoBus Ireland ordered eight 9700s, and among other orders Coopers Tourmaster opted for a 53-seat B11R Jonckheere. As well as the vehicles, there was a simulator that enabled visitors to experience what driving a coach with the new Dynamic Steering function feels like as well as a City Mobility Simulator that showed the emissions savings that could be made in cities across the world if Volvo’s hybrid, hybrid electric and full electric bus range was used instead of diesel. In a press conference on the stand, Scania fielded different experts for each vehicle. It was the first UK show for the Interlink HD Finesse, the successor to the OmniExpress and built in the same plant at Lahti in Finland. The 12.8m two-axle coach shown (a 14.1m model is also offered) had the K410 4×2 SCR chassis with independent front suspension, 13-litre engine and two pedal Opticruise transmission. It was equipped with 53 half leather seats with three point belts but the specification is customisable. Included in the accompanying pre and after sales package is two years repair and maintenance by the Scania network, technician familiarisation, a driver training facility and ten years of telematics derived vehicle data mailed to the operator every week. Over 400 have been supplied in Europe in the last year and 30 have been ordered already for the UK for 2017. Alongside the Interlink was an Irizar i8 on a K410 6×2*4 SCR chassis with two-pedal Opticruise, 53 half leather seats and aircraft lockers doors among its features. Already five have been ordered with two demonstrators expected next year. Hitherto, Scania has not offered a Euro6 compliant double deck option but now it has one. It is the gas powered N280 UD4x2EB with five-cylinder, nine-litre, Scania OC09-101-280 Euro6 unit that will run on standard CNG but qualifies for LCEB when operated on biomethane produced from waste. Indeed, I was told that, if operated using waste derived biomethane, the CO2 emissions can outperform those of a full electric bus. Fitted with ADL’s Enviro400 MMC body, the bus, which is a demonstrator, has a standard ZF Ecolife six-speed automatic gearbox incorporating Topodyn. It has a three way catalyst, EGR and SCR. The first five have been ordered by Reading Buses who also took earlier single deck Scania gas buses. One of the five appeared on the ADL stand. General Manager, Fleet Sales, Mark Oliver, told me that whole life costs make it a viable option for operators. Scania is working with experts on infrastructure supply including the Gas Bus Alliance. Outside was a latest specification Irizar i3 bus bodied Scania bus and a two axle Scania Touring coach. Reading Buses confirmed an order for six 12m Irizar i3 buses on Scania K 250 UB4x2 chassis with 250hp DC09 111 engines at the show. 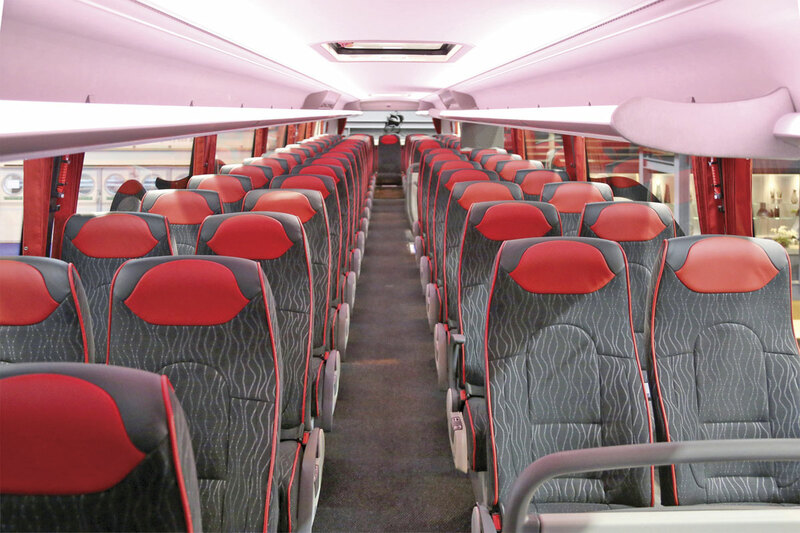 They will have 41 seats Lazzerini seats, USB chargers, white destination signs and customised interiors. Among other orders announced by Scania, Southampton-based Princess Coaches (an all Scania fleet) is to take three 12.8-m 53-seat Interlink HDs, which will be the UK’s first to be equipped with a rear door and rear-mounted washroom. A rather bigger repeat order comes from City Circle and calls for a further 16 13.22m K410 EB6x2*4 tri-axle with Irizar i6 53-seat and centre toilet coachwork. City Circle took 20 Scania Irizars earlier this year. 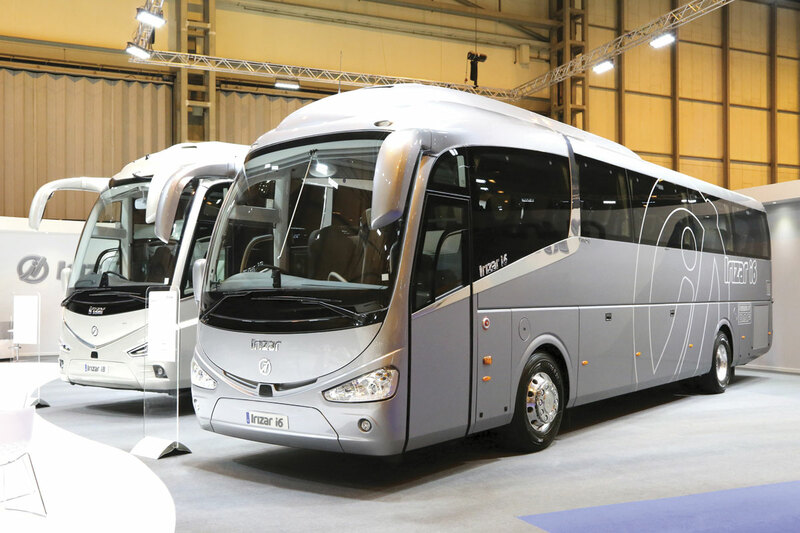 Irizar UK’s stand was designed to show the breadth and depth of the company’s offering in the UK as well as spotlighting the individual i4, i6 and i8 models. The three show-liveried coaches shown exemplified this. 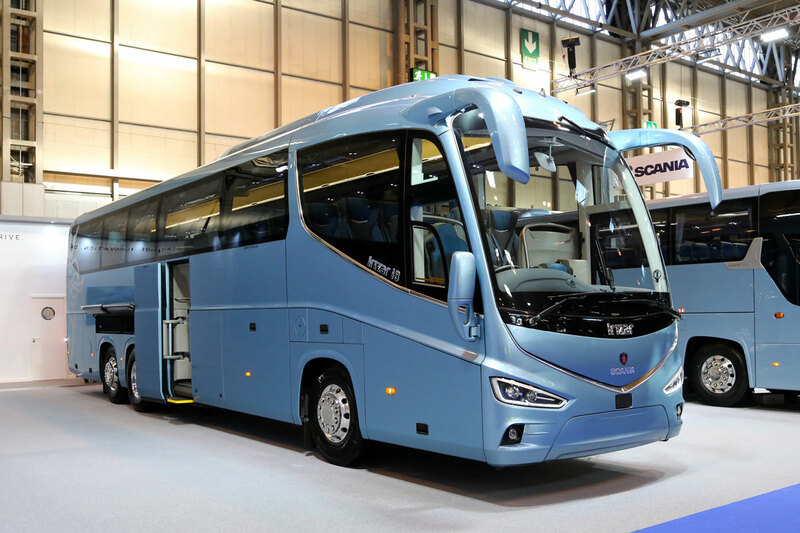 Remarkably, and helped by a large order for Mexico, Irizar has already sold in excess of 1,000 of the i8 top of the range coach model that has replaced the former PB range. It is offered in the UK on three axles at lengths of 13.2m and 14.07m with two different toilet arrangements. On the stand was a comprehensively specified 14.07m variant with 57+1+1 full leather seats, sunken toilet, 460hp Paccar-DAF MX13 engine and ZF As-Tronic automated manual transmission. The well established i6 appeared in 12.2m 49+1+1 and toilet touring form with Paccar-DAF MX11 369hp engine and ZF Ecolife automatic transmission. Completing the line up was a 12.9m i4 schoolbus with 70 Prime three point belted seats, ZF Ecolife transmission and the 369hp Paccar-DAF MX11 engine. Just as the stand showed the brand’s versatility, so have recent orders. Golden Boy Coaches has ordered four more Irizar integrals, each to a very different specification. There are two i6 Integrals, one a 10.8m 38-seater and the other a 12.9m two-axle coach, a 70-seat i4 Integral and Golden Boy’s first i8, a 53-seat, 13.2m tri-axle. 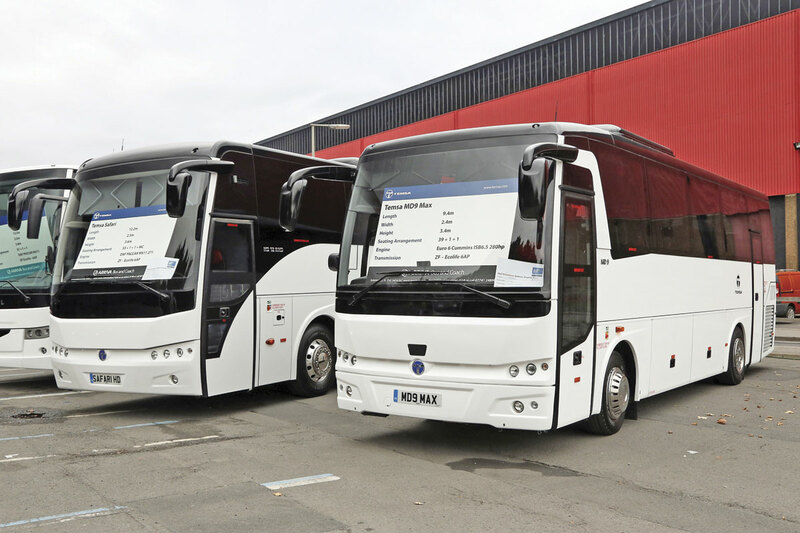 With these purchases, half of the 18 front line coaches operated will be Irizar integrals. For Kent based Centaur Coaches, a new customer, the requirement is for wheelchair lift equipped coaches for use on scheduled airport services. The five coaches it has ordered are four 12.9m Integral i6s with 55 seats and one 14m i6 Integral. The PLS lifts are fitted at the centre nearside. All have Paccar-DAF MX11 engines and ZF Ecolife automatic gearboxes, the 12.9m examples delivering 369bhp and the 14m 435bhp. With ZF recently upgrading the Ecolife gearbox, Irizar Integral designs can be offered with it with all engine options other than the 510bhp MX13-375 variant, which means everything up to the MX13 at 462hp. Talking to Julie about the company she said the year was finishing strongly with total sales expected to be similar to 2015, in the mid 70s. Things were already buoyant for 2017. She said the i8 was doing what they had hoped it would, ten having now been sold of which the first seven are in service. The i-Drive event at Rockingham in August had gone well and would be repeated in 2017. Currency changes meant that prices would be going up with immediate effect, an example being the retail price of a 12.2m i6 49 seater rising to £247,000. While in Birmingham I also had the opportunity to talk to Hector Olabegogeaskoetxea (at college in London it was shortened to Smith) about the Irizar e-mobility division, which he heads. The new 18,000 sq.m factory being constructed 15km from San Sebastian is well advanced and should be complete by January and completely commissioned in the months thereafter. It will be capable of building 500 buses annually on a single shift. Hector revealed that unlike the existing 12m i2e full electric bus which uses Sodium Nickel (SoNick) batteries, the new 18m articulated version will employ Lithium Ion technology, though he declined to say in what form. 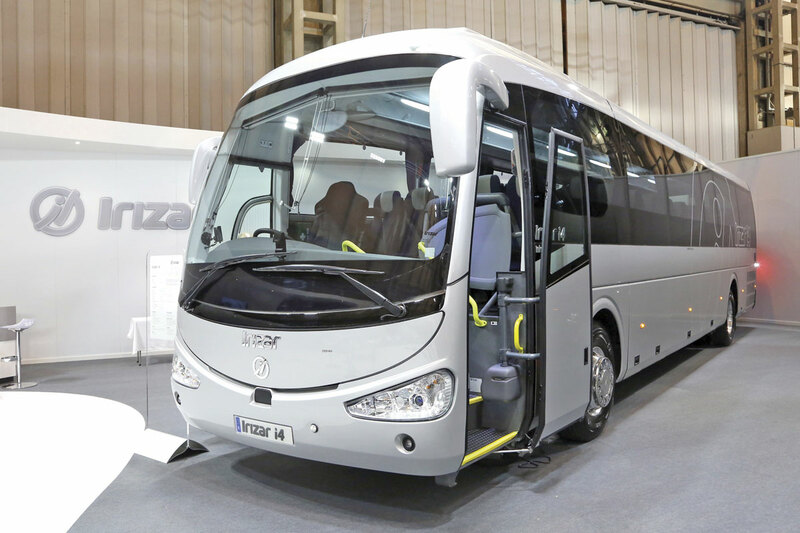 The Irizar built driveline will have a 230kW continuous rating and a 300kW peak output with torque of 2,200Nm along with ZF axles. Prototype versions of the artic, which promises an appearance with wow factor, are complete and undergoing testing. There is also to be a shorter 10.75m version of the i2e. Hector predicted a 20% growth in the energy density available from batteries by 2020, which he believed was a realistic figure. He believes that despite some claims being made, there will always be the need for battery balancing. 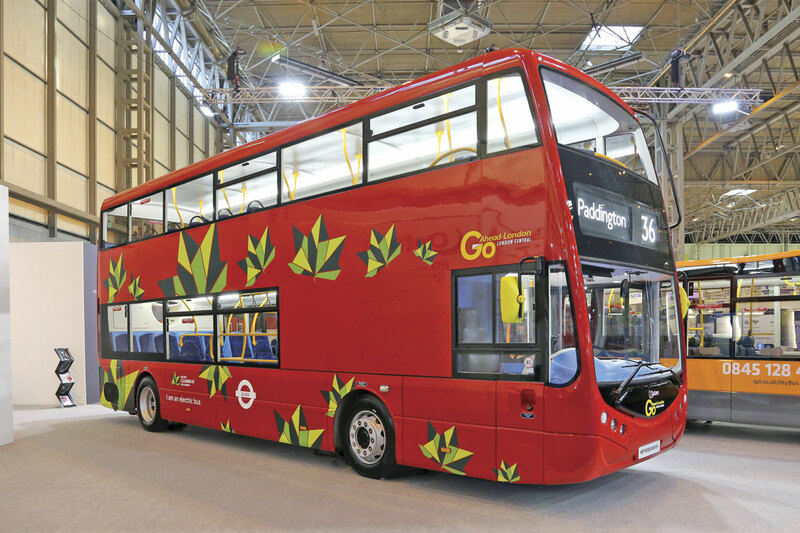 Optare has been promising an electric double decker and the Metrodecker EV appeared in the colours of TfL on whose services it is to be operated by Go-Ahead London on route 36 from early 2017 for three months to prove the concept. The actual bus exhibited is not entirely new, as it is the one B&CB tried out at Millbrook a while back when it was equipped with a diesel unit. 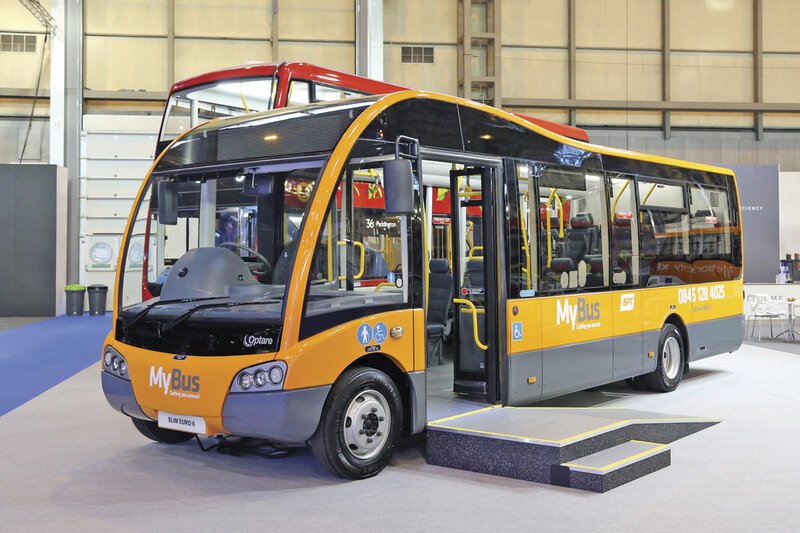 Optare has worked with Magtec to rework it with a 200kWh battery pack, using batteries of a higher density than those the company currently uses. This fits in the vehicle where the engine and gearbox were previously located. The estimated range is 105-145 miles and it can be recharged in six hours. It has a 95 passenger capacity with 63 seats and a GVW of 18 tonnes. Perhaps surprisingly, Optare is ‘passionately opposed’ to increasing the maximum GVW for buses to 19.5tonnes as it does not believe it is necessary. I don’t see too many other manufacturers agreeing. 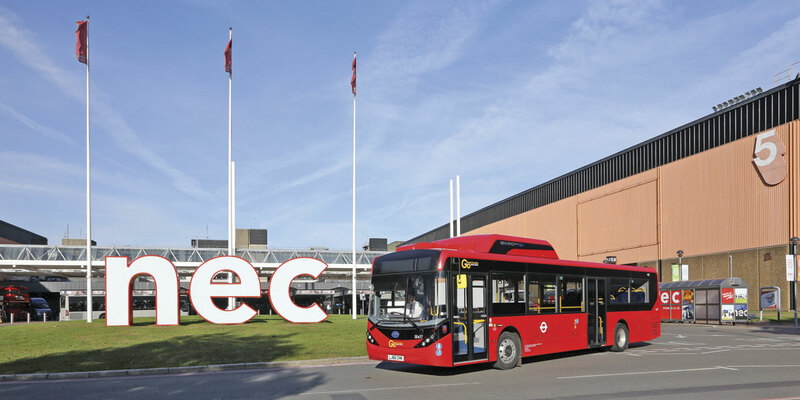 The full electric Metrodecker was joined on the stand by the Metrocity EV Extra Range, also shown in TfL livery, which is being used as the testbed to prove the high density battery technology. It has a 138kWh capacity and a typical range of 130 miles on TfL work. An 11.5m Euro6 Metrocity xFE was shown to full LCEB specification equipped with the AllisonT3270R xFE high efficiency gearbox. An airport specification 11.5m Metrocity for APH appeared outside. Also present was a Slimline 7.9m Solo SR Euro6 for SPT that now offers increased commonality including styling with the rest of the Optare range. 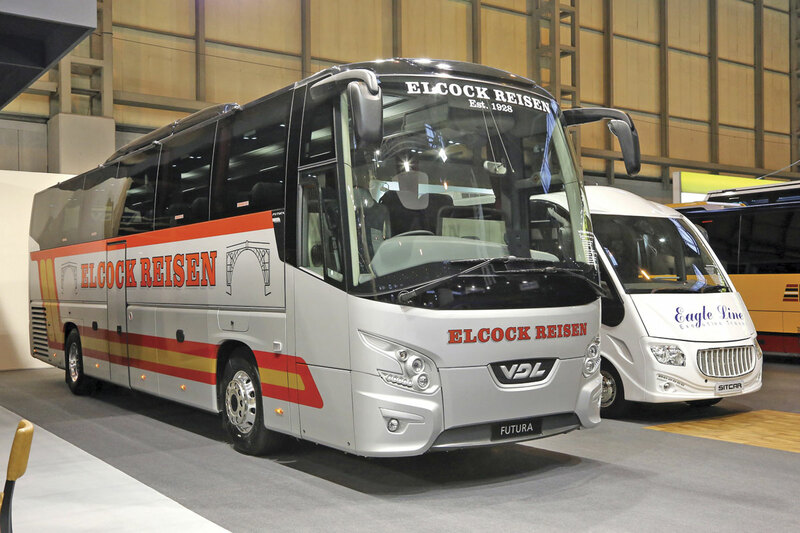 Among orders announced at the show was one for four 34-seat Mercedes-Benz Euro6 powered Solo SRs from Reading Buses. They will work on a contract service for a corporate client based in Newbury. On the vehicle front, the company displayed four buses on its stand, two single deck and two double deck. 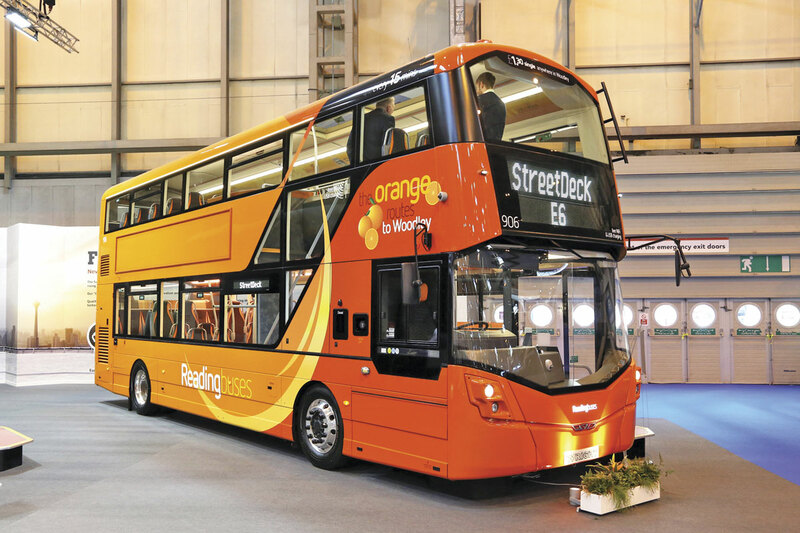 The double deckers were one of six 10.4m StreetDecks for Reading Buses in an orange colour scheme and an 11.4m Lothian closed top B5TL Gemini 3, shown in addition to the open top version on Volvo’s stand. 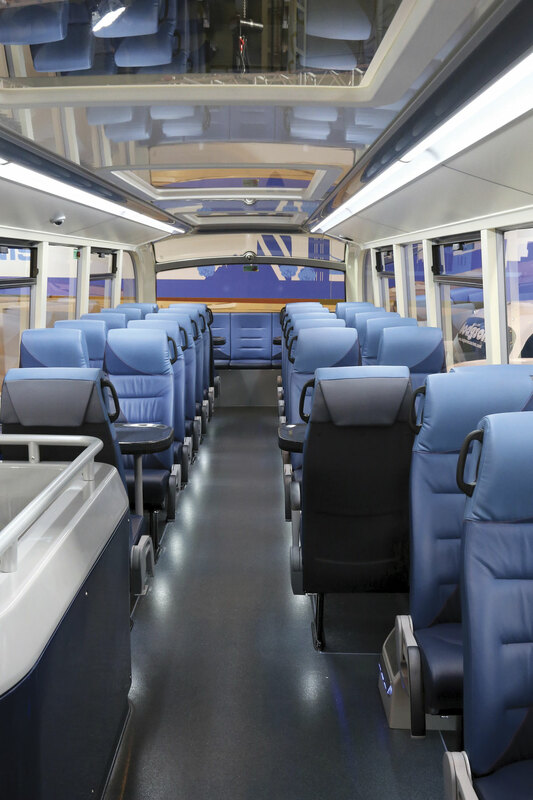 In addition to special features such as illuminated front logos, the Reading Streetdecks have 5.1-litre Daimler engines, a Voith D854.6 gearbox, a micro hybrid system and a 100 passenger capacity (70 seats/30 standees). Under the new framework agreement with Lothian to 2020, the operator has additionally agreed to take five StreetAirs, the recently launched zero emission, full electric range which offers three charging modes: overnight, inductive or conductive. 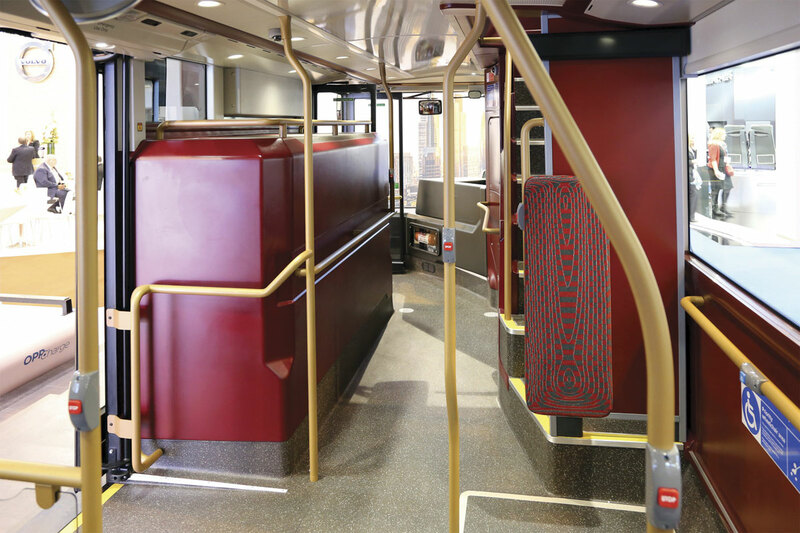 Displayed was a TfL specification10.6m two door single deck StreetAir EV based on the StreetDeck chassis platform. It has a Siemens ELFA 2 electric drive system, Nickel Manganese Cobalt batteries and will spend a period on an evaluation project in Liverpool with Arriva before transferring to run for the same company in London. Range on an overnight charge is 200miles/18 hours. A new feature is an infra-red heating system. 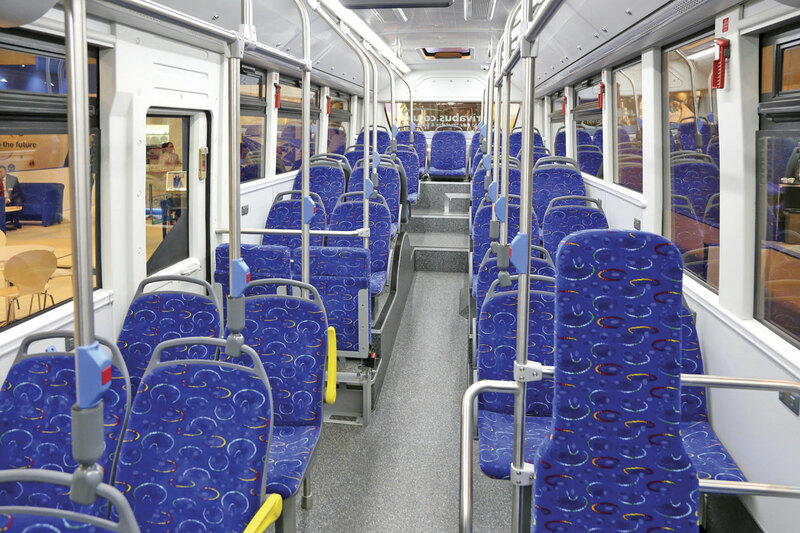 Passenger capacity is 72, 23 of them seated. The fourth exhibit was a 10.8m StreetLite DF which will be the first of Wright’s third generation Microhybrid models to enter service. These have an additional third smart alternator, electric air compressor and stop/start engine technology, making them more efficient than the previous generation. It is one of 16 destined for Metrobus for use on Fastway services at Gatwick Airport. Evobus UK gave visitors a clear idea of the cost of operating leases for one of their growing range with prominent weekly prices displayed in the windscreen of vehicles on the stand and in the demonstration park. A 12.14m Tourismo in Redwing colours with side wheelchair lift provision was advertised at from £626 weekly, while adjacent tri-axle Tourismo Ms showed £675 and £661 respectively. One of these had every type of seat available with the Tourismo installed in the interior to demonstrate to operators what the options were. It looked strange but served a useful purpose. It also had a Frenzel cold drinks vending machine holding 90 cans which costs £5,000. On some operations it is more profitable to forego the two seat spaces it occupies and sell drinks instead. 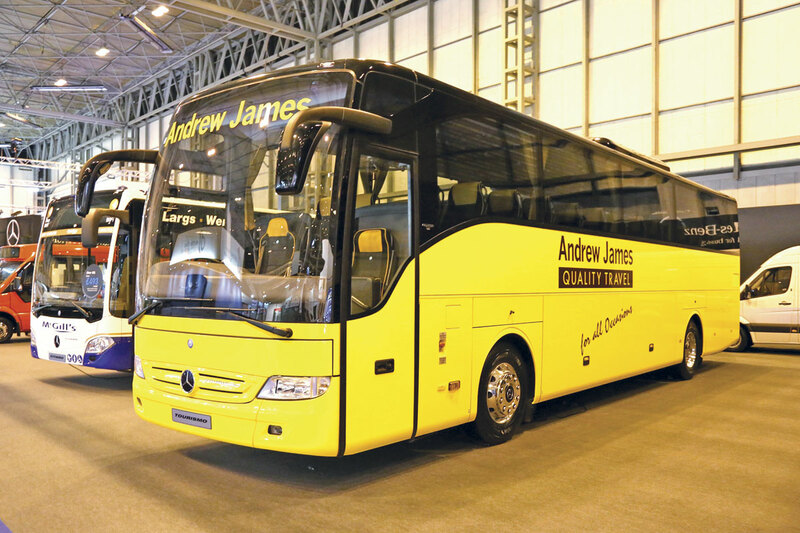 On the stand a second two-axle Tourismo appeared in the yellow colours of Andrew James Travel. This did not have a window sticker. Several other executions of the Tourismo appeared in the demonstration park. Transfer and City versions of the Sprinter were shown, the City 45 featuring air suspension rather than leaf springs on the rear and a new electric retarder option, as well as a cash desk based on that of the Citaro and a foot pedal microphone. It is scheduled to go on long term trial with one of the groups. 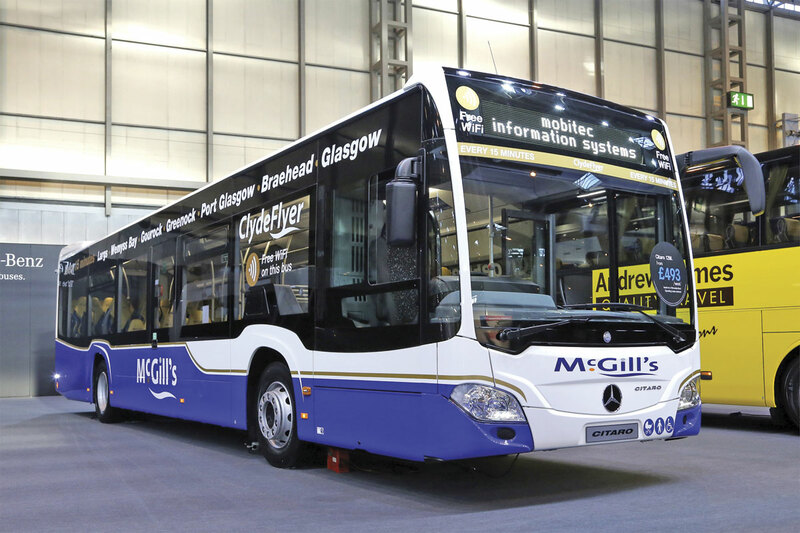 Representing the Citaro range was an example for McGills, which is building up a considerable fleet of the type. The Citaro can be leased from £493. The dash arrangement was also a new development. It once seemed unlikely that Mercedes-Benz would ever sell an articulated Citaro again in the UK but a right hand drive version of the Euro6 Citaro G has now been developed and the first two orders for the model have been placed. The first calls for two three-door buses for Bristol Airport with OM936 engines and Ecolife gearboxes. Big news on the order front was a repeat order from Shearings Leisure Group calling for 43 Tourismos, due to be delivered in spring 2017. National Holidays will take 14 12m coaches and 29 will go to the Shearings Holidays fleet. All will have OM 470 engines, full air conditioning, arm rests, foot rests and dual 19” monitors paired with professional Bosch audio/visual systems. Another important order came from Dawsonrentals, calling for 20 Tourismos, split equally between two and three axle variants. MD Michael Thielman and Sales Director, Marcus Watts reported ‘A good three days’ with big interest on minibuses throughout from both small and large customers, and healthy coach interest across the board. Marcus said the 53 seat plus toilet solution had been received very well. In total, orders for in excess of 90 coaches were placed over the three days, many of them not previously discussed. It was all about the Neoplan on the MAN Bus & Truck stand, with three versions of the Tourliner displayed. 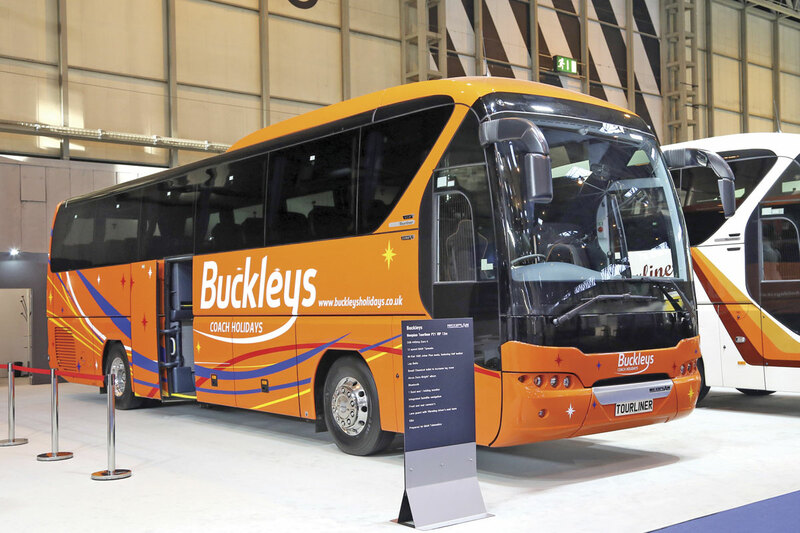 In the orange colours of Buckleys Coaches was a two-axle 12m P21 VIP with Kiel 1020 Joker Plus half leather seating for 49 passengers, the D26 440hp Euro6 engine and MAN TipMatic 12-speed automated manual transmission. The 13.2m P20 displayed was another VIP model, this time for GH Watts. It had the 480hp D26 unit and 53 Kiel 1020 Joker Plus half leather seats. Completing the line up was a stock 13.8m P22 with 440bhp engine, 61 Kiel 2010 seats, a fresh water toilet, steel wheels and a Synectics eight camera CCTV system. Wayne Ulph told me that MAN had some stock Tourliners to both VIP and Select specifications available at pre-Brexit prices, though a number had been sold at the show. When these were gone the next batch would not arrive until February, though these would be at the new price and would have the Euro6C engine upgrade. All will be to Select specification together with alloy wheels, Efficient Cruise and Efficient Roll, a year’s free telematics, the telematics derived Fit to Go system with real time fault notification, and four year comprehensive warranty (which excludes service items, bulbs etc). The only price increase would be the cost of the E6C engine upgrade, taking a P21 to £205,000, a P20 to £225,000 and a P22 to £235,000. 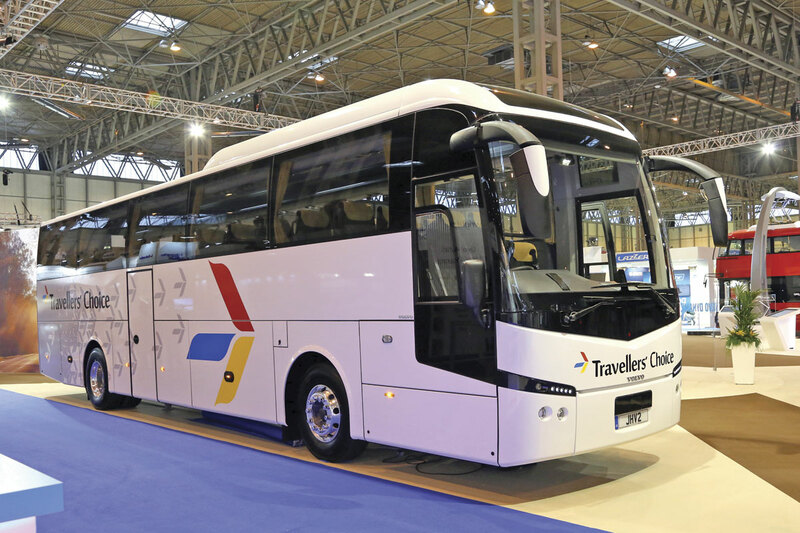 The UK will also get the new look Tourliner shown at the IAA with the first demo expected in April and the first production versions in June/July. Only one vehicle appeared on BYD’s stand, one of the double deckers that entered service on TfL contracts earlier this year, although there was one of the BYD/ADL Enviro200EV single deckers on the ADL stand and another outside giving demonstration runs. The company has already announced a second order for the ADL JV product and hopes to reveal more in the near future. It will also deliver a batch of complete BYD built buses to Nottingham soon. Recent news is that BYD will open a new bus building factory in Hungary during 2017, which may supply chassis for the UK. The company is also actively looking for a second manufacturing location in Europe which won’t be in the UK. I was told that production of a right hand drive electric coach was not close although it is likely that the company will bring over one of the Paris coaches early in the new year to gauge interest. 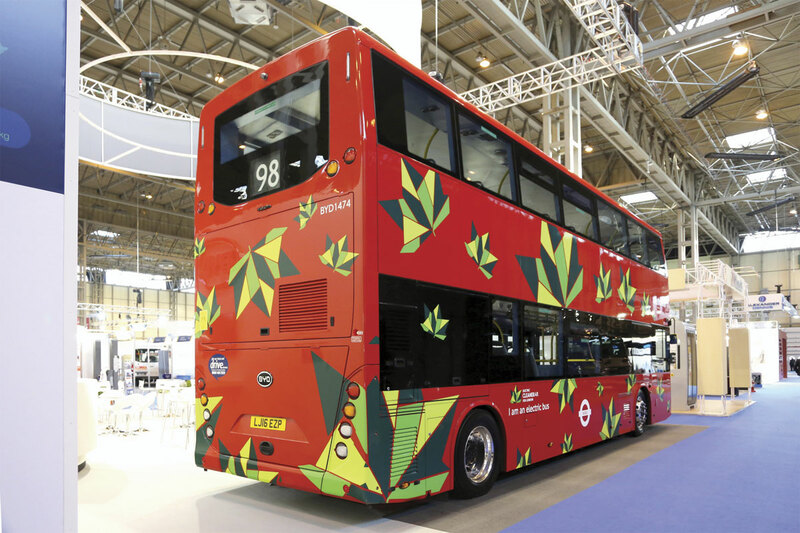 The new development for the UK market shown by Yutong was an E12 full electric bus wrapped in the colours of Arriva, where it will be spending some months on test, probably in Liverpool. 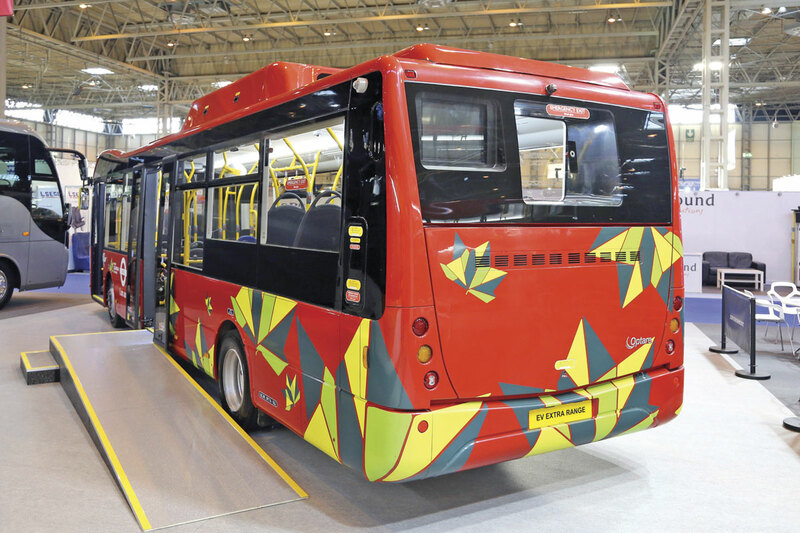 Yutong, which expects to build 75,000 buses and coaches this year and export 8,000 of them, has been offering pure electric buses since 2010 when it supplied the first to the Chinese domestic market. 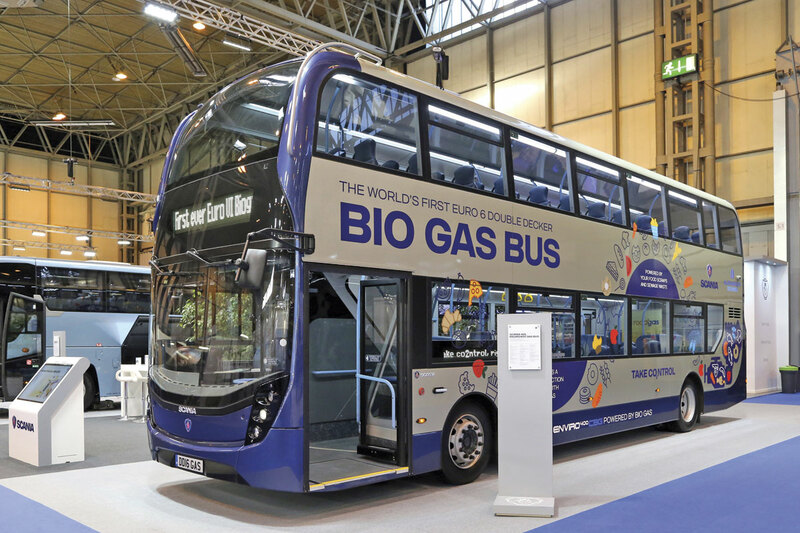 To date, it has produced 26,000 ‘new energy’ buses, a term it uses to cover both hybrids and full electrics, though not gas buses which it also produces. It has two plants at Zhengzhou, the newer of which is devoted to new energy products and European build. In the UK it has recently renewed its contract with Pelican Bus & Coach to 2020 and beyond. Yutong had a large team present in Birmingham and talking to Ren Hong, Director of the International Marketing Department, I was told that while some are using NMC or LTO battery technology Yutong believes that LFP (Lithium Iron Phosphate) offers the most reliable and stable option at this stage. The entire bus including all of the electrical components (but not the European built ZF axles and steering and certain other European components) was designed in Yutong’s own R&D facility though some parts were built on its behalf by contractors. It was exclusive to Yutong and not available to any other manufacturer. The bus was shown with Yutong’s own door system but operators could specify Ventura if they wished. I was told that the monocoque aluminium framed bus weighs 14tonnes, three tonnes of which is the batteries. Displayed with a single door it can alternatively have dual doors. The driveline layout is conventional in that a big electric motor (YTM280-CV9-H) replaces the engine and gearbox; it does not have hub motors. In the form shown the range was said to be over 200km with the air conditioning running and over 250km without. All of the 16 modular battery packs (weighing 180kg per pack) are roof mounted and the bus has been successfully tilt tested. It is claimed that the batteries will still retain at least 80% capacity after a minimum of 3,000 full discharge cycles, the equivalent of around nine years service. Recharging is overnight and takes five to six hours using a 60kW charger though there is also a fast charge option taking 120-150 minutes which requires a 150kW charger. For the time being the company is not offering battery rental packages but says it will work on them depending on market requirements. Ren Hong stressed that this was a true zero emission bus on which the doors, heating, pumps, steering and other key systems were all electric. There were no diesel pre heaters, though if you wanted that it was possible at a reduced price. Warranty terms are two years on the whole vehicle with five years (with no mileage limit) as standard on the battery and electrical components. This can be extended at a cost to eight years. As shown, the price of the bus was £350,000. In addition Yutong will be supplying the recharging systems which cost £35,600 for a two bus 60kW charger and £82,500 for a four bus 150kW charger. I was told that both charging systems plug straight into the mains and are ready to go, though you would need to make arrangements with your supplier before doing so. A right hand drive 10.8m electric bus is also being developed which will be available around the end of the first quarter of 2017. Asked about other products I was told that Yutong and Pelican are researching the double deck electric market and are building a 12m inter city electric coach. This is a three step design with underfloor luggage capacity. 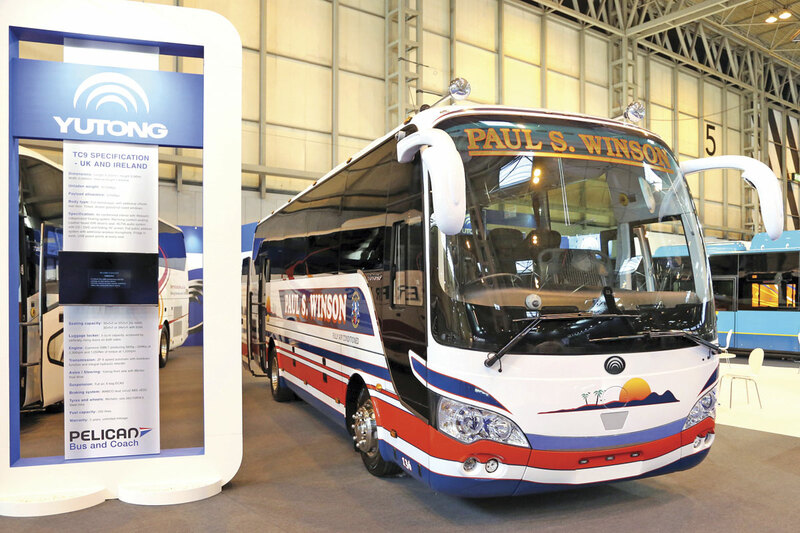 How well accepted the Yutong brand has become in the UK coach market was reflected in the two coach exhibits shown, both of which were for high profile operations. The TC9 midicoach with Cummins engine was for Paul Winson of Loughborough while the 12m TC12 was one of a pair for Berrys of Taunton. Berrys has been appointed as a service centre for Yutong. Further examples of both models were shown outside, the TC9 in the colours of Celtic Travel. BASE always take appearing at the NEC very seriously and this is no doubt one of the reasons for their sales growth in recent years. They showed three vehicles in the hall and two more outside. Carrying MobiPeople DDA Explorer 330 coachwork was the sixth similar 70 seat coach for Festival Travel. It was mounted on a MAN RR8-290 with ZF Ecolife transmission, though from November/December build MAN will move over to Euro6C engines. A second Explorer, for Wheelers Coaches, appeared in the demonstration park with 74 seats+1+1, the total having been achieved by adding another triple seat and fitting a six-place rear seat. Also from MobiPeople was a MidiExplorer on an MAN TGL10-220 chassis for Timberbush Travel. Customer requests have prompted MobiPeople to add a separate driver’s door to the specification of the Midi Explorer. With the impending ULEV creating a strong pull factor for the Explorer, this years sales will be roughly double those of last year with next year looking good based on current orders. This year, the MobiPeople plant at Coimbra will build 52 coachbuilt vehicles as well as around 80 minicoach conversions up from a figure of 45 plus 80 last year. It specialises in small bespoke niches and has delivered some truly extraordinary vehicles in recent months including buses on Volvo FL7 truck chassis with high floors and tilting cabs for Funchal in Madeira and small open roofed Mitsubishi Canter based coaches for Sintra and Coimbra. BASE also offers the Barbi range and the stand coach was the second for Anthonys Travel, being a 10.35m with 37 seats and a toilet on an MAN RR2-360 chassis. Anthony’s have a third Barbi, a 12.4m 32-seat team coach on order for December delivery. With the move to Euro6C, the RR2 chassis will go from 360hp to 420hp with the Ecolife gearbox. Shown outside was a 13.1m MAN RR4-480 AS-Tronic 57-seater for the Holmeswood fleet. 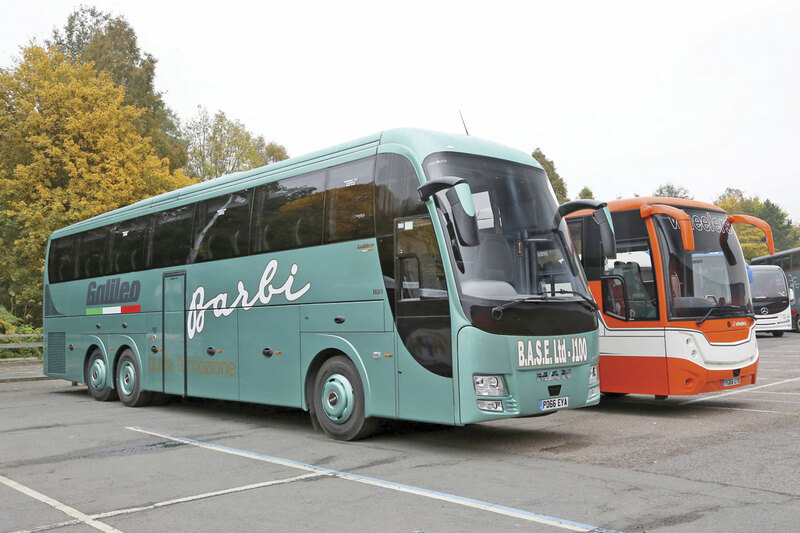 In total, BASE have supplied ten Barbi coaches this year. 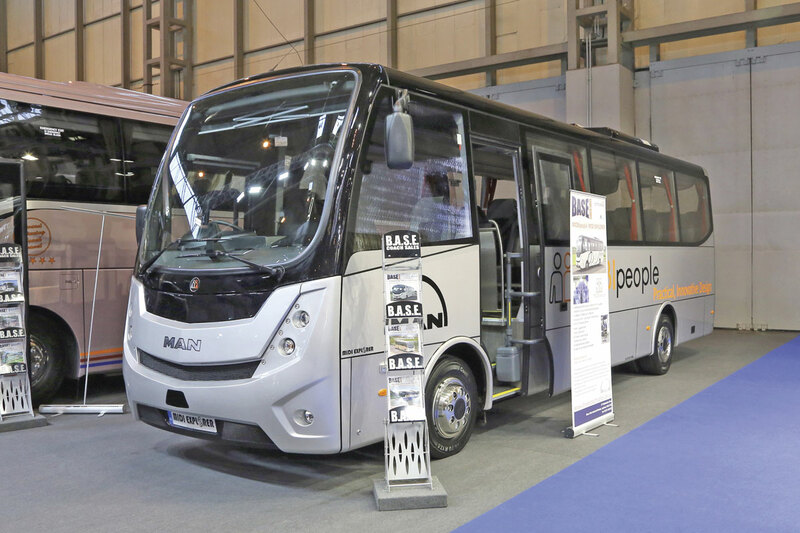 The associated Moseley companies offer VDL, Beulas, Indcar and Sitcar in the UK and all were represented on the same stand across the aisle from Van Hool, which is also offered. Sitcar and Indcar will be covered in Rob Orchard’s report. From the VDL stable, the largest of the two exhibits was the first UK showing in right hand drive of the new Futura FDD2, a 14.1m model in a striking livery for Galleon Tours. This provided 86 Vogel Contouro seats, a centre toilet, the 510hp Paccar-DAF MX13 power unit and the 12-speed AS-Tronic automated manual transmission. Retail prices for a 13m FDD2 are from £400,000 with 77seats+1+1+toilet, for the 14.1m 89 seater that rises to £410,000. The Futura FHD2 shown was a 12.2m long FHD2-122.370 example which is the first to be purchased by Elcock Reisen. Power comes from the Paccar-DAF MX11 rated at 370hp matched with the ZF 6AP1700B Ecolife automatic gearbox. The 49 seater has 10 cu.m. of luggage capacity, a 3CR12 stainless steel frame and whopping 830-litre fuel tanks as standard. Prices are from £264,000, with the 12.9m model from £270,000. A new option from September 2017 will be a right hand drive 10.5m version of the Futura FHD2, with 43 seats and centre toilet. From the Spanish Beulas concern there were three exhibits, the biggest of which was another double decker, the MAN RR4 mounted Jewel. The coach shown was a 13.9m stock vehicle seating 83+1+1 with a toilet. The retail price was £393,500. Slightly smaller was the second 13.2m Mythos for Blakes Coaches, the only difference from the first one being that this example had painted rather than vinyl signwriting. A 53 seater with toilet, a touch I liked was the entrance step kick-plates personalised with the company name. A stock specification 13.2m coach would retail at £311,800 and the longer 13.7m with 59 seats at £317,400. Completing the Beulas line up and somewhat dwarfed by the other two was a 12.7m Cygnus for RB Travel with a reduced capacity of 51. The Cygnus is mounted on the two axle MAN RR2 chassis which currently has the 360hp engine but for 2017 will have the larger 420hp alternative. Prices are from £247,500 for the 12.2m and £252,500 for the 12.7m. MD, Karl Moseley, told me that the show had been a busy one with business done on the stand. As reported in last week’s issue, for the first time in the VDL Group’s history, the prize for the VDL Dealer of the Year was won by Moseley although they had won the first Bova Dealer of the Year title to which the VDL trophy is the successor. Van Hool’s stand featured three coaches. 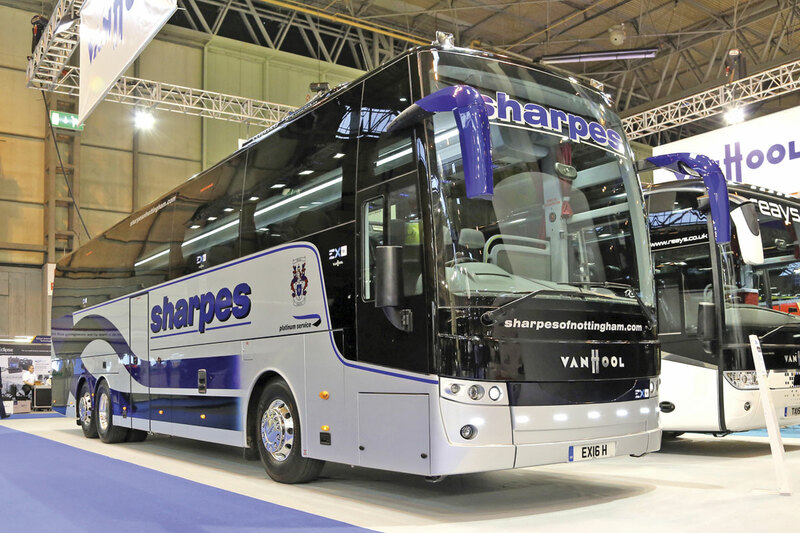 For Sharpes of Nottingham was a 13.386m long EX16H with seating for 57+1+1, Paccar-DAF MX11 435hp engine and ZF Ecolife 6AP1700B automatic transmission. The paintwork, applied by S&G after it had been on the road for three months, attracted a lot of admiration. This, and a 12.2m TX15 Alicron for Reays were both supplied by Arriva Bus & Coach. The Alicron’s specification included seats for 49+1+1, Paccar-DAF MX11 368hp Euro6 engine and ZF Ecolife automatic transmission. Outside there was an EX15H for a French customer with 51 seats and a toilet, though UK versions, when they become available will only be capable of carrying 49 plus toilet. Both the EX16 and EX17 are currently available from stock. Supplied by Moseley was a TDX21 Altano for Watts of Bonvilston near Cardiff. This accommodated 63 passengers upstairs plus three and a wheelchair plus courier downstairs. Once again it had a Paccar-DAF engine, this time the 462hp MX13 in combination with the ZF AS-Tronic automated manual gearbox. Two significant Van Hool orders that Moseleys have won are one from Dave Parry for three TX17 Astrons with 510bhp Paccar-DAF MX13 engines and Allison Automatic transmission, while Mike Eaves at Eavesway is taking a further four TDX21 Altanos with 460hp MX13 engines and Allison automatic transmission. 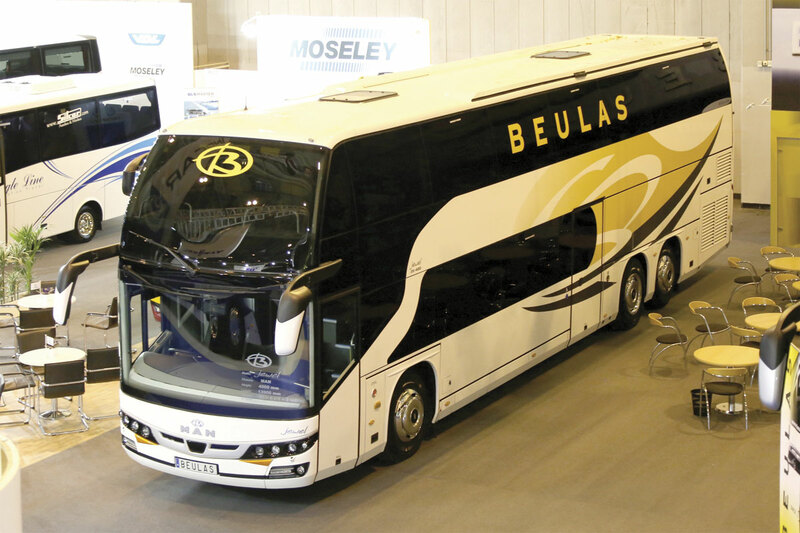 Moseley can still offer the Scania Van Hool combination as a two-axle coach, but only to order. It is Temsa and Arriva’s intention to add a third model to the range imported from Turkey and to this end a left hand drive LD13 model was shown. Aimed primarily at the school market with two nearside doors, it had 63 2+2 seats, although a 3+2 layout would potentially offer a capacity in the mid to high 70s. A wider door with lift is an option and there is 6.5cu.m of luggage capacity. The engine is the 368hp Paccar-DAF MX11. Also shown was the 9.4m Temsa MD9 midicoach which is 2.4m wide. In the colours of Lynns Travel of Eastbourne, it had 34 seats, a five cu.m luggage capacity, a rear saloon toilet, a full height rear nearside door, the Cummins ISB6.5 280hp Euro6 engine and a ZF Ecolife automatic gearbox. Arrriva have already sold 24 MD9s and a show offer until the end of November for vehicles registered by the year end means operators could buy a straight 39 seat MD9 Max model (without part exchange) for £149,999, rather than the normal £164,000. There were similar deals to be done on the 12.2m long HD12 Safari coach, an example of which was being used as a bar coach on the stand. For the limited period of the deal, a straight purchase can be concluded at £199.999. Arriva representatives confirmed there were no bus products on offer for the time being. They also introduced the latest member of the sales team, Bob Birch, who is covering the Midlands. A decade and a half ago, the Spanish manufacturer, Ayats, enjoyed reasonable sales success in the UK and Ireland, especially with the Bravo double deck family, when it was marketed by Anglo American. It has continued to supply limited numbers to the UK to customers such as Jumbocruiser and the Original Sightseeing Company who took delivery of four integral Ayats 12m open toppers in August this year, having taken two a year earlier. These were direct deals but after spending a few months researching the market it has approached Dave Nickson, proprietor of Stockport based Elite Coaches, to handle UK and Irish Sales. Chosen for his knowledge of the product and his ability to sell, Dave has set up a new company to handle this called Ayats UK Coach Sales Ltd. It is completely separate from his other business interests, though it is headquartered in Stockport. It is already holding parts stocks and has started contacting operators of the 100 or so Ayats vehicles that Dave believes are operational in the UK. The new company will be offering the full Ayats range including the 12-15m Kronos single deck coach, the Spirit high deck at up to 15m and the Eclipse double deck coach at 13.2m, 14.2m and 14.6m. All are UK homologated I was told. The company also supplies specialist sleeper coaches, restaurant/bistro coaches and band buses. Furthermore, it is developing an all electric open top decker with an Actia power train and batteries that is expected to be finished in the summer of 2017. 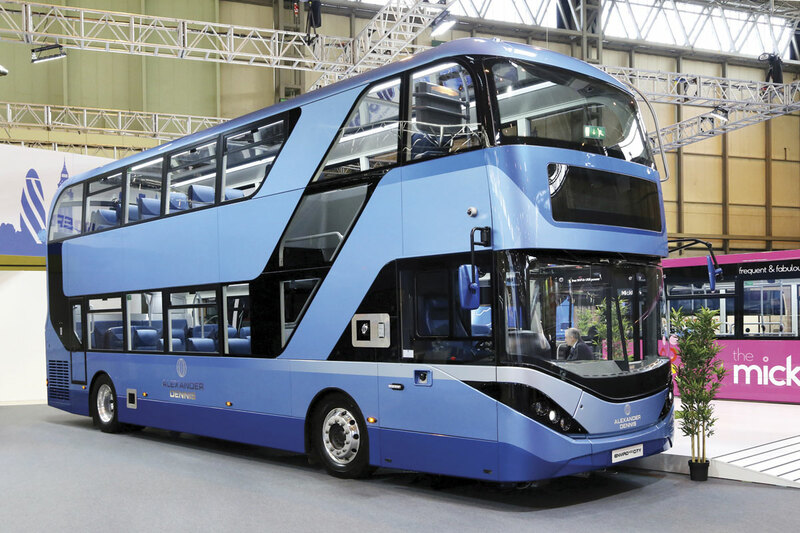 Dave anticipates that the biggest demand will be for double deckers with MAN or Scania running units and he has already placed an order for an MAN powered example. Elite UK will be assisted in its efforts by Ron Telford of Landmark Finance Ltd who will be offering structured finance packages through Landmark as an option. 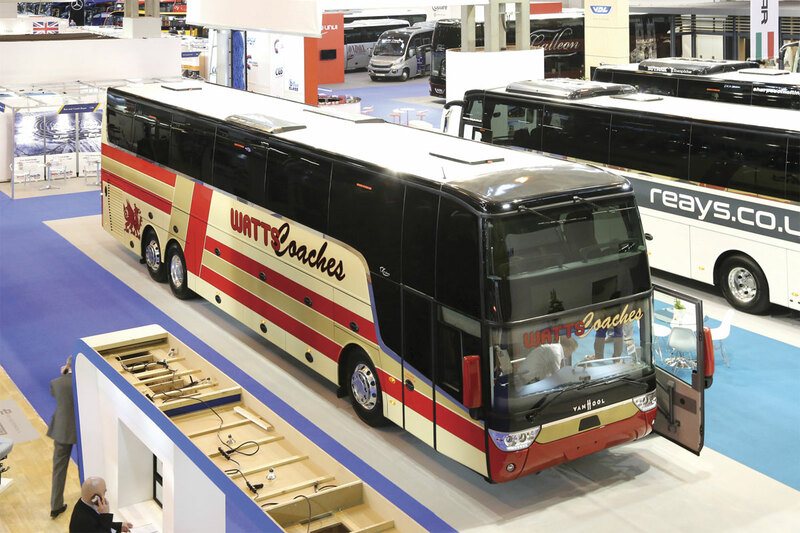 Based at Arbucies, Ayats expects to build 150 coaches in 2016, 70 of them for Mexico, and 95% of them double deck. In addition to a stand inside Hall 5, a German specification Eclipse double deck coach was shown immediately outside the exhibition area. Mounted on an MAN RR4-480 chassis, this featured 79 seats, a rather large bunk over the offside front axle and a new toilet design. At the time of writing this, I haven’t seen the attendance figures for the show, my gut feel is that it may have been slightly down on two years ago, but all the major exhibitors I spoke to were pleased with the calibre of people they saw and reported having generating real orders as well as strong leads for potential future business. You did not get the feeling that Brexit was dampening buying trends greatly, and in the coach market TfL’s ULEV is prompting investment from many, though there are others looking at Mayor Kahn’s accelerated programme and concluding that he has gone beyond what is reasonable and worthy of the investment risk for operators, especially when we have seen Paris saying that it will allow only electrics. Whether there will be sufficient compliant coaches in London for the post ULEV demand remains to be seen, as does whether those who do invest (whether funders or operators) will be able to operate their fleets for sufficiently long to be able to amortise them? For next year, there is a new name for the smaller of Diversified’s annual shows, Coach & Bus UK, although I did detect more questioning of the need for a second show among the larger exhibitors than I have for some time. Personally I would prefer to see it retained but the balance between cost and return has to justify that.